Toy Story 3 was a crowning achievement for the most famous CG animation franchise of them all, and while Lee Unkrich’s film wrapped things up very tidily it did leave us wanting more. A chorus of hurrahs met the news that Pixar’s next film, Cars 2, would be fronted by an all new Toy Story short entitled Hawaiian Vacation, and Disney Pixar have just released a new look at the highly anticipated new short. 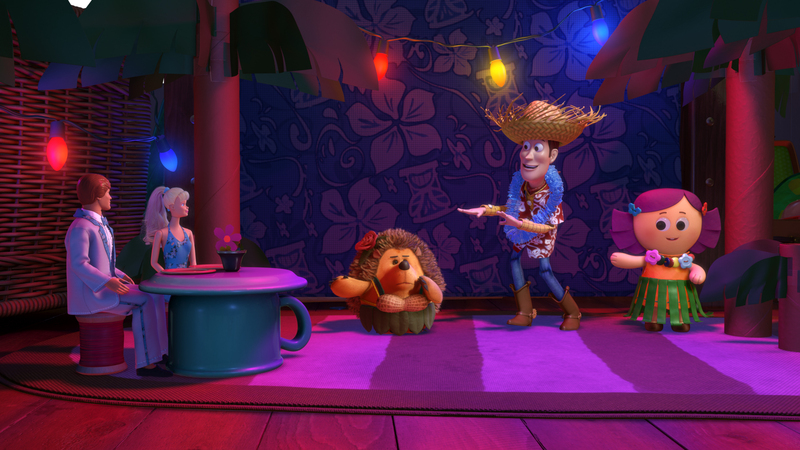 Set in new owner Bonnie’s bedroom, “Hawaiian Vacation” features Woody (voice of Tom Hanks ) and Buzz (voice of Tim Allen) and the rest of the favorite “Toy Story 3” toys as they create the ultimate Hawaiian vacation for Ken (voice of Michael Keaton ) and Barbie (voice of Jodi Benson ). It seems Ken badly miscalculated their travel arrangements, so the gang has to create a dream getaway in Bonnie’s Midwestern bedroom—in the middle of winter. “Hawaiian Vacation” also features the voices of Joan Cusack , Wallace Shawn , Don Rickles , Estelle Harris , Blake Clark , Bonnie Hunt , Timothy Dalton , Kristen Schaal , Jeff Garlin and John Ratzenberger . Here’s the image, and everything else we know about Toy Story: Hawaiian Vacation is here. Previous articleIs This The Teaser Poster for Dredd?